I have to admit that I was furious when this game was changed from Vicarage Road to Villa Park. I had booked my holiday after the announcement of the Graham Taylor tribute game, so to find that I would now be unable to attend was a bitter pill to swallow. But an opportunity to go to Villa Park, a ground that I love, was not to be missed. On the train to Birmingham, my podcast of choice was Colin Murray at home with Luther Blissett. It is a great listen. My annoyance at Murray’s lack of research when asking Luther about the first time he played at Old Trafford was tempered by his gleeful reaction when Luther told the story of what happened on that occasion. Needless to say, they finished up talking about GT and both with great fondness. Since GT’s passing, Luther takes every opportunity to pay tribute to his friend. Marking anniversaries of triumphs and just saying thank-you for the memories. It has been lovely to see and is a mark of the great characters of both GT and Luther. Our pre-match pub is lovely and it was great to have my sister, brother-in-law and niece joining a very reduced travelling party. A gin festival was taking place which, added to the real ale and lovely food usually on offer, meant that everyone was happy after lunch. As we waited at the bus stop to go to Villa Park, we struck up a conversation with a lovely couple. It was a mixed marriage, she was a Villa fan, he was a blue-nose. We talked about our mutual admiration for GT. She told us about the tribute they had at Villa Park. A wreath was laid on the pitch and Rita, Joanne and Karen were there. As we parted company she wistfully commented, “I wonder what would have happened if he hadn’t taken the England job.” That gave me pause for thought. I wonder if he would have stayed at Villa and maybe moved on to a bigger club. In that case, we wouldn’t have had that wonderful second spell. But he didn’t and we were all there to celebrate the wonderful memories that he left us with. The crucial piece of team news was that Pereyra would be making his first public appearance this pre-season after featuring against Rangers at London Colney earlier in the week. The starting line-up was Gomes; Cathcart, Kabasele, Kaboul, Mason; Cleverley, Doucouré, Chalobah; Amrabat, Sinclair, Pereyra. Villa included former Watford loanees, Gabriel Agbonlahor and Henry Lansbury in their starting XI. As soon as the teams emerged from the tunnel, they lined up and there was a minute’s applause for GT with both sets of fans singing “There’s only one Graham Taylor” at the tops of their voices. It was very moving. Villa had a very early chance as Agbonlahor broke free to challenge Gomes, but it was the Watford keeper who came out on top. 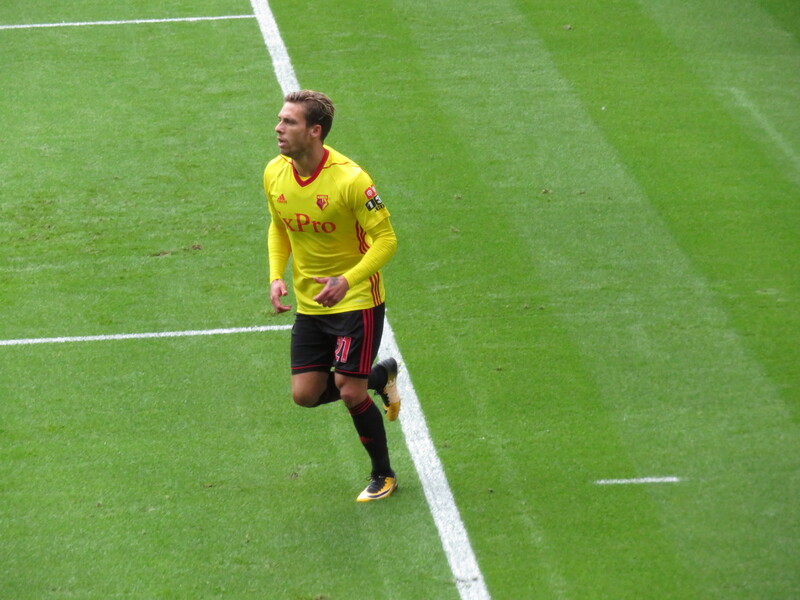 Watford had to make an early substitution. I must admit that I was rather disappointed to hear Pereyra’s name announced as the player leaving the pitch. He looked baffled himself and, to my shame, I was relieved when it turned out that it was Kabasele going off. In my defence, he was being replaced by Prödl! Sinclair should have opened the scoring after quarter of an hour. Doucouré found Pereyra who played a through ball for Sinclair who only had the keeper to beat, but fired wide. On the half hour, here was a stir in the away end as Deeney appeared pitch-side and, after some negotiation with the stewards, made his way into the stand to sit with the Watford fans. Needless to say, it took him some time to get to his seat. 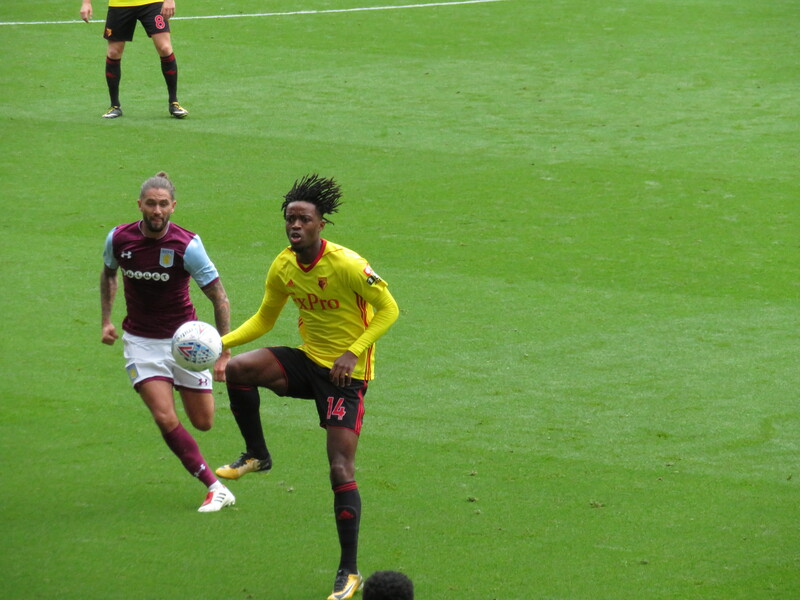 Watford had another chance as Chalobah got into a great shooting position, but he fired over. We reached half time goalless. It had been a pretty dull half of football. The home side had the majority of the possession, but neither keeper had been tested. At the restart, Pereyra made way for Success. The Nigerian made an immediate contribution, crossing to Cleverley, who played the ball back to Chalobah who, again, fired over the bar. Then Cleverley took a free kick from a dangerous position, but it was directed straight at the Villa keeper, Steer. Disaster struck as Kaboul tripped Hutton in the box and the referee pointed to the penalty spot. In the away end, we were singing the name of Heurelho Gomes with all our might and our man celebrated his new contract by guessing correctly and diving to his left to save Henry Lansbury’s spot kick. We were located in the away section closest to the home stand. When the penalty was awarded, they took the opportunity to taunt us. So, when the penalty was saved, I was a little taken aback (and rather proud) when my usually mild-mannered niece, after celebrating the save, gave them some grief back. On the hour mark, Silva made five changes with Gomes, Kaboul, Cleverley, Doucouré and Amrabat making way for Pantilimon, Femenía, Watson, Hughes and Okaka. There was a lovely move as Success released Femenía who advanced down the right wing before delivering the return ball for Success to try a shot from distance that flew wide of the near post. The game had livened up since the substitutions and there was another nice move as Femenía crossed for Success, whose side footed shot was blocked and rebounded to Hughes who, unfortunately, was unable to follow-up. Another chance fell to Success but, on this occasion, the shot was weak. 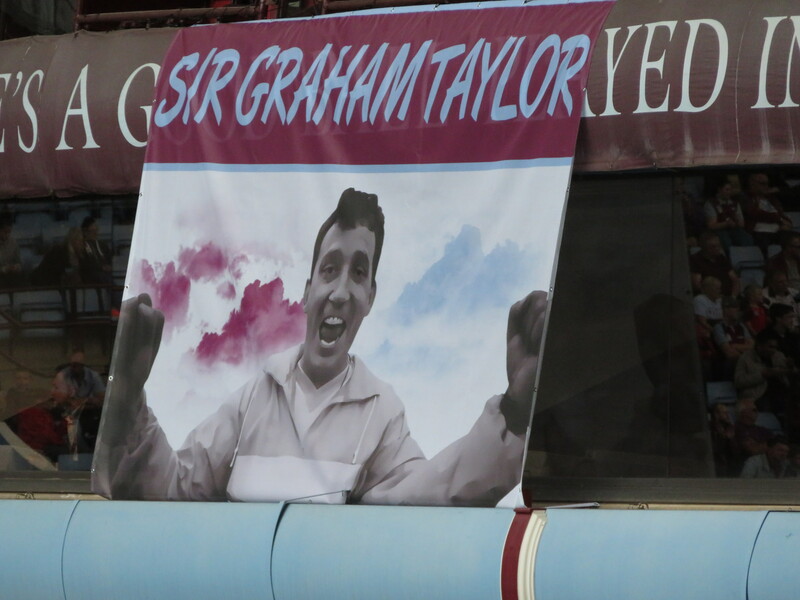 Just before the 72nd minute struck, the Villa fans started the applause, the travelling Hornets joined in and the chorus of “One Graham Taylor” rang out again in earnest. The next decent chance fell to Villa as a cross reached Amavi in front of goal, but he slashed the ball wide of the near post. Sinclair had a golden chance to open the scoring as he ran on to a ball over the defence from Success, but the keeper arrived first. The final chance fell to the home side as Hourihane hit a shot from the edge of the area, but Pantilimon was equal to it and the game ended with honours even. It had been a typical pre-season game with nobody taking any chances. From a Watford perspective, the second half had been livelier than the first. It was good to see Pereyra back. The first impression of Femenía was very positive and there was some nice interplay between him and Hughes. If Sinclair had been sharper in front of goal, we would all have gone home happy. But this game was not about the result, it was about 10,900 people gathering to pay tribute to Graham Taylor. The legacy that the man has left will never leave Watford and Villa also have reason to thank him hugely for rescuing them from the doldrums. On the way out of the ground, I spotted some people with half and half scarves. I usually sneer at these, but this scarf had a picture of GT sewn into it, so I had to have one. On the train home, I opened the match programme. I had to close it again pretty quickly as the sight of a middle-aged woman sobbing on the train would not have been a pretty one. Typical of the man, among the tributes from former players were those from the kit man, the club secretary and the programme writer. There was one word that featured in the majority of tributes, it was ‘gentleman’. There was also a lovely piece written by his daughter, Joanne. A fitting tribute to a wonderful man. 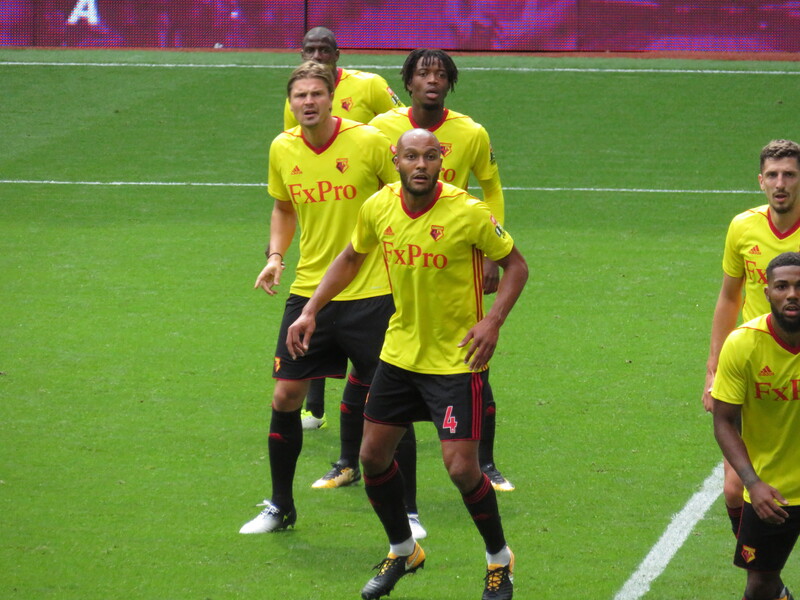 This entry was posted in Watford FC and tagged Abdoulaye Doucoure, Ahmed Elmohamady, Alan Hutton, Andre Green, Aston Villa FC, Ben Watson, Birkir Bjarnason, Brandon Mason, Christian Kabasele, Christopher Samba, Conor Hourihane, Costel Pantilimon, Craig Cathcart, Gabriel Agbonlahor, Glenn Whelan, Graham Taylor, Henri Lansbury, Heurelho Gomes, Isaac Success, Jack Grealish, James Bree, James Chester, Jed Steer, Jerome Sinclair, John Terry, Jordan Amavi, Kiko Femenia, Leandro Bacuna, Marco Silva, Nathaniel Chalobah, Neil Taylor, Nordin Amrabat, Roberto Pereyra, Scott Hogan, Sebastian Prodl, Stefano Okaka, Steve Bruce, Tom Cleverley, Watford FC, Will Hughes, Younes Kaboul on July 30, 2017 by franelynn. 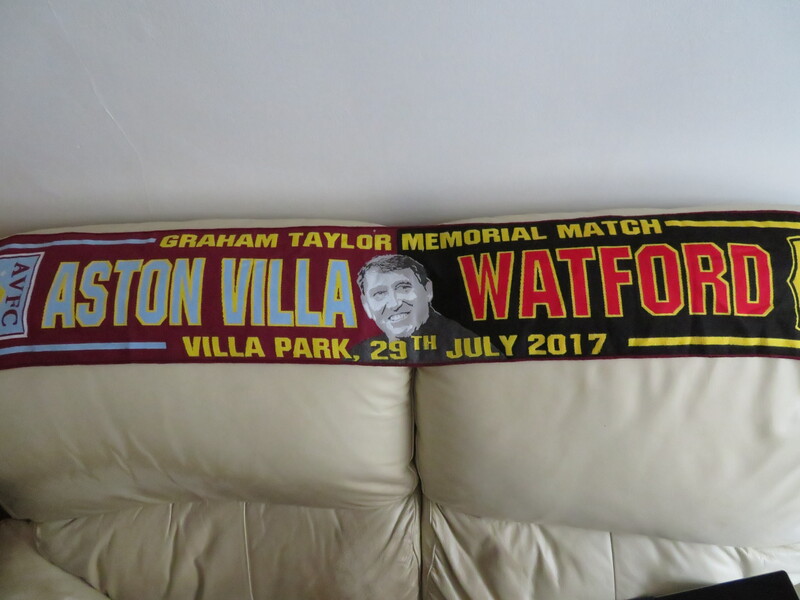 moving tribute ….A half and half scarf is normally scorned by true football fans but on this occasion was exactly the right item to wear…. Again, very many thanks Frances. A very lovely write up – greatly appreciated.